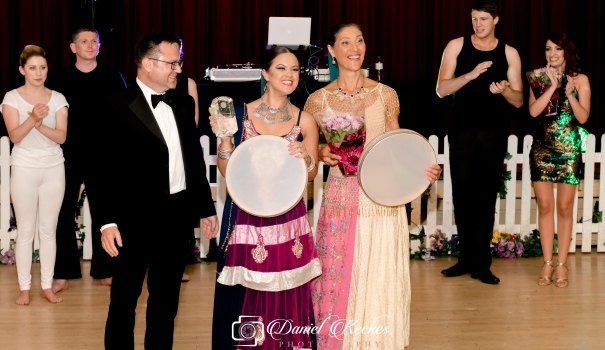 On Friday evening, Ayesha Ben-Cheikh was crowned 2017 Business Come Dancing Summer Ball Champion with a stunning Persian performance with professional dance teacher Kataneh Karimian. It was another spectacular Business Come Dancing event hosted by Pavilion Dance South West and Lewis-Manning Hospice in the Pavilion Ballroom. Business participants delivered rip roaring, high energy routines time after time which had the audience on their feet in delight. With new performances of Persian dance, and Caribbean Bachata and well as some old favourites such as street, contemporary, and 1940’s social dance, the standards were set high by the PDSW professionals. Ayesha’s winning performance was closely followed by Hannah Walker and Cali Headley’s contemporary piece and Joseph Garrett and Charlene Crack’s bachata routine. “We are delighted that this event is going from strength to strength, and seeing so many individuals approaching dance for the first time with absolute commitment is commendable. We thank everyone for their donations, time and energy spent on this event as our work with Parkinson’s Dance is such a valuable part of what we do“, said Zannah Doan CEO of PDSW and Head Judge. The event, sponsored by Mazars and Zip Yard, raised over £4500 for these two local charities and the funds will be used to develop new Parkinson’s classes out into the region as well as funding the valuable work carried out at the hospice.